And though it pains me to loose any teenage boys that may be following this blog….. I opted to go with the zucchini. appreciate this treasure of a recipe. 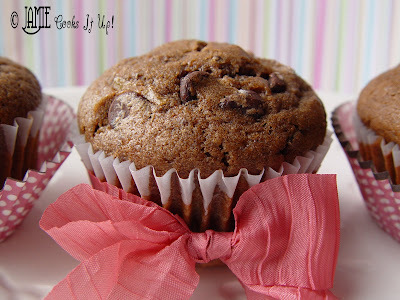 PS…..TeenSonMark ate no less than 7 of these muffins in one day. Bring on the green monster of a vegetable. 1. Mix the wet ingredients together in a bowl with a whisk. Add the zucchini to the wet ingredients. 2. Mix all of the dry ingredients in a separate bowl with a wooden spoon. 3. Pour the wet ingredients into the dry and stir, just until combined. Fold in the chocolate chips and you are ready for the muffin pan baby. 4. Line your muffin tin with cupcake holders and fill a bit more than 2/3 of the way full. 5. Bake at 350 for 17 minutes. the green monster of a vegetable in all it’s glory. Gonna have to try these Jamie and tell you son that I have done many post on the green monster of vegetable and many people still read my blog and enjoy the green monster posts. I love zucchini! 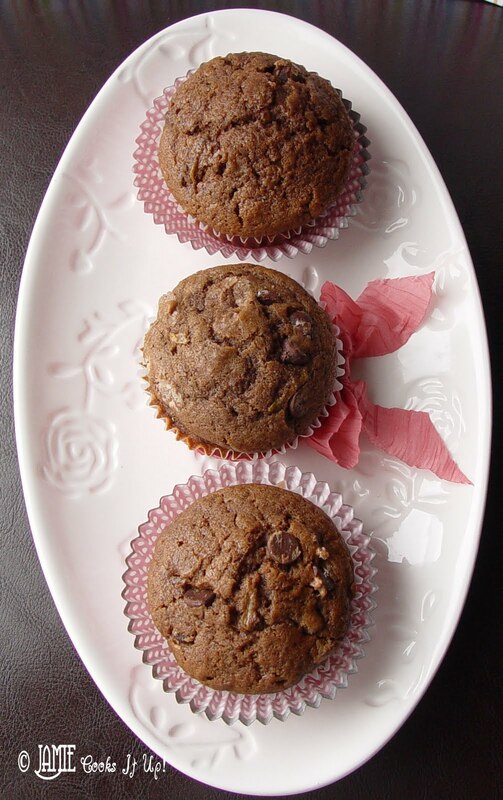 These muffins look fantastic! Congrats on winning the apron Julie!! I use a very similar recipe and make a cake out of it. I'll have to try some individual servings and make cup cakes next time. I love the chocolate chips too. Thanks for the recipe. No need for frosting on these beauties. I love, LOVE zucchini!!! I will be making these REAL soon!! Ok…so I stumbled on your blog and I am LOVING it! I was looking for the breadsticks my mother-in-law makes…you have the recipe! Yeast and I have a love-hate relationship. I love breads…but yeast has it out for me as I have yet to be successful w/ baking any form of bread…I am not giving up though. look forward to checking out all the other goodies you have here! Although I am sure my hips won't! Great disguise for those green veggies taking up space in my refrigerator. I love them but no one else does. Now if you can come up with a beet muffin I'd be all set! If my teenage son starts reading cooking blogs I'm going to take his temperature(and I won't be putting the thermometer under his tongue,either!). I love this recipe. My zucchini is just starting to produce. TightwadMom and Jennie….you two are killing me! Beet muffins really exist!? What a hoot! Too bad I didn't plant any! Take it easy with that thermometer! Yummy!! Had to share this recipe!! BTW- I've totally put beets in chocolate cake before. It makes it a red velvet cake without having to use all of that food dye and it makes it really moist- much like the zucchini does. Although I just use canned beets- way easier than growing them and they just taste like dirt anyway! I've just been introduced to your blog, and I love it! I also LOVE zucchini recipes. Thank you. I made the baked zuccini slices with the mozzerella cheese last week for my whole family, and it was a huge hit! thank you! The zucchini muffins will go into my recipe box. They look great and I'm sure that taste just as great. YUM! I'm going to have to give these a try! Love this combo! Tried these and LOVED them! I was totally surprised by their fantastic flavor and just the right amount of sweetness. Everyone I shared them with loved them, too! Thanks. I made these and my kids couldn't stop eating them. I also gave some to a few friends and they called me immediately and said how wonderful they were. Thank You! Found this on Tastespotting! Thanks for the recipe! It was simple and the results, fabulous! They're moist, light, and oh so chocolatey! Yum, yum! I had one last bag of frozen shredded zucchini languishing around in the freezer and an itch to use it with chocolate. Some people are just sick. Glad you're one of them. These were great. Thanks. I'm going to try to healthify them so i don't feel guilty eating 10 million. I'll let you know how it turns out (feel free to ignore it if you think healthifying a perfectly good muffin is a sin). Thanks again. I would love to hear how the healthy version turns out! Good luck…hope they are fantastic. 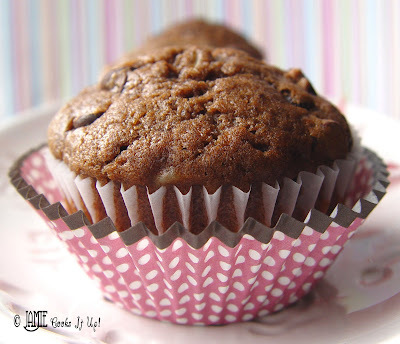 I just made your muffins (with a few personal tweaks!) They turned out great, thanks! I cannot explain how awesome these muffins turned out! Super moist and chocolate-y. They were a huge hit and I'm definitely making another batch soon! Ok, thanks! I am stocking my freezer for my next baby. Just made these, and they were moist and delicious! I love these, my boys love these, and I just tried a mini-version of them that turned out great! Thanks!